My father’s name was Herbert Erich Mantel. He was a diesel mechanic, born in Hamburg, Germany on August 17, 1898. He traveled to Barranquilla, Colombia in the 1920’s, I think. He was Chief Engineer on a riverboat on the Magdalena River at first, and later he managed the German Club in Puerto Colombia. He married my mother, Clara Eugenia Struss, a native Colombian of German and Spanish descent. She was born in Ocaña. I was born in 1935. 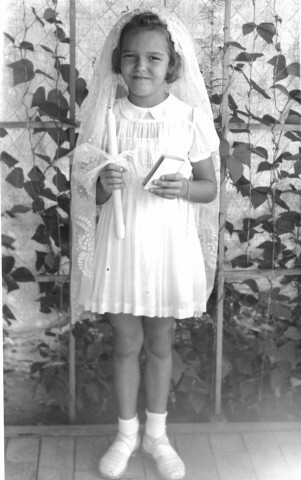 In 1942 we moved from Puerto Colombia to Barranquilla, when my parents bought a house there. I remember one day getting on a school bus to go to the German school. When I got home I found out that my father, along with many others, had been arrested. Life turned upside down for me that very day. I was uprooted from my home, my grandparents, and my uncles and aunts (my mother’s parents and siblings). We were very close; they all helped raise me from baby on, until we were taken away from them. My mother was the oldest; then there was Henny, Carlos, Hugo, Eleanor, Henry, Waldemar, Brunhilde, and Javier Struss. We were taken to Buenaventura, and in May of 1942 we were sent to the U.S., along with other families, on the S.S. Acadia. The ship sailed from Buenaventura on the Colombian west coast, through the Panama Canal to New Orleans, LA. I remember crying on the ship, because the men could not go outside during the passage, and I didn’t want to leave my father’s side. Records from the National Archives show that I had taken ill and had fever, but I was treated by doctors and/or nurses, and got well. I remember we were treated like guests. I especially remember my first taste of cornflakes for breakfast. That made a great impression on me. (I can still taste them!) There were lots of other good meals. We children played all over the hotel. I remember finding some money in one of the couches and running to tell my parents. I remember roller-skating and one time jumping from an inside balcony and breaking my right arm. I still skated with my right arm in a cast. Another memory was my dad taking me to the river in front of the hotel to put a little sailboat in the water. It sailed away to where we couldn’t get it. On July 9, we were moved to the Grove Park Inn, in Asheville, North Carolina. Shortly after that we were taken to the Assembly Inn in Montreat, North Carolina. National Archive records show that my father had to have a hernia operation at Mission Hospital in Asheville in October 1942. Six months later, on April 17th, 1943, my mother had a tonsillectomy done at the same hospital. Then diplomatic and non-diplomatic families were separated, and on May 2, 1943, we were moved by train to the Internment Camp in Crystal City, Texas near San Antonio. 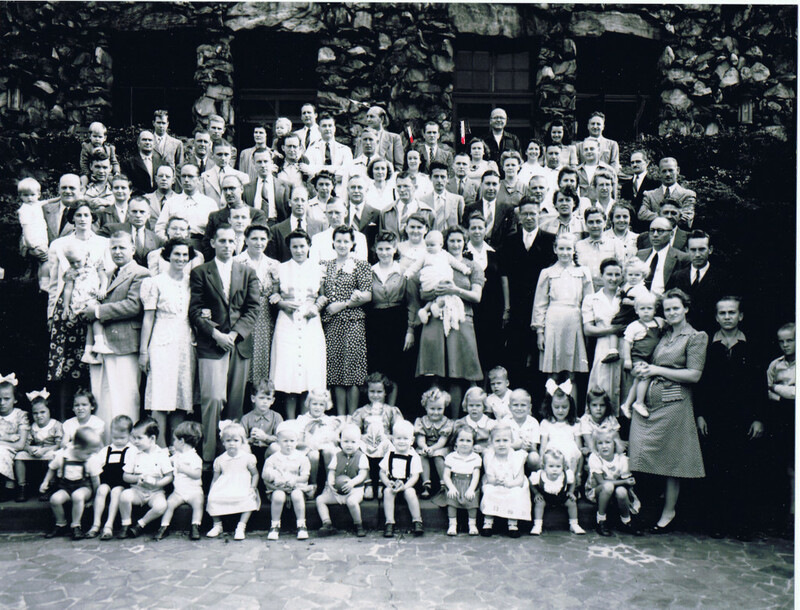 Some of our Columbian friends were in the Crystal City camp with us: the Edmund Schmitz family, with a son and two daughters, Clara and Betty; the Evers family children, Ingeborg (Inge), Christa, Gerda, and Hilde were my childhood friends, and the Steimles with one daughter and a little son. I’m still in touch with Inge and Christa Evers, who live in Florida. My photos show that the conditions at Crystal City were a little primitive. There was a high chain link fence and on each corner high up were guardhouses. I crawled under the fence one day, trying to catch a little lizard. Priests and nuns took the women and children to San Antonio for our first communion. 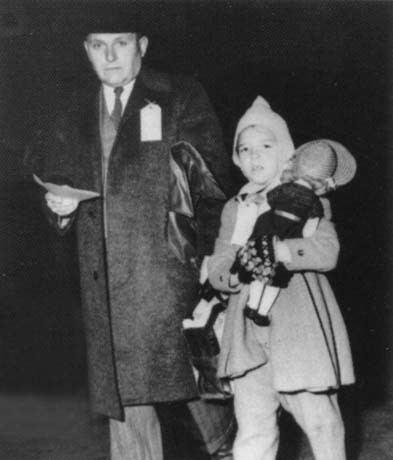 On Feb. 12, 1944 we were sent to Ellis Island, New York for repatriation to Germany. I remember sleeping in the upper bunk on the Pullman train. That was neat! I have a photo of my father and me, taken as we boarded the Gripsholm, all bundled up—I look like I was freezing. In Puerto Colombia, where I was born, there was nothing but sunshine, and we lived right by the sea. We traveled to Portugal, and from there were put on a train to send us into Germany, to Buchloe, Bayern (near Munich), where my mother’s side of the family lived. I remember there were children standing on the platform begging for food, holding up their little hands to us. Wars are something awful, aren’t they? We chose to go to Buchloe, because my Mom’s aunt, Annie Struss, and her husband, Otto Kugelman, and his mother lived there. My father’s parents, Hädwig and Paul Mantel lived in Dresden. I remember bombs falling, and the home we were in shaking, and my mother covering me in bed, trying to get me to go to sleep. Living in this small town only a few bombs fell, but sirens would go off a lot, signaling us to go to shelters (cellars). But sometimes we stayed outside in the garden under apple and pear trees, watching the sky blazing red with fires from the bombings in Munich. We heard that many people were burned alive, because the fires couldn’t be extinguished. Other people who had stayed in cellars were buried alive. It was very scary and so sad to experience. Because my grandparents on my father’s side lived in Dresden, we got to go visit them only once. My grandfather (Paul Mantel) took walks every day, and one day, after a bombing, he never came back. It hit me very hard, because a few days before he had pulled me on a sled on one of his daily walks. Like being taken away from family in Colombia, again I lost a grandfather. After this, my grandmother, Hädwig, and my aunt, Annie (my Dad’s sister), moved to Dortmund, where they lived until they died. I have cousins still living in Dortmund and in Koln. As a child I didn’t realize the hardships. I do remember that food was rationed, and we would exchange coffee beans, that my grandparents in Colombia sent, for milk, butter, potatoes, etc. My memories of those days are mostly good ones, even though food was scarce and shoes and clothes were all hand-me-downs. At the time I had no idea what my parents went through. My parents never discussed it. I only know that my father was made to swear not to raise arms against the U.S. before we were sent to Germany. In Germany I had to run fast, because the kids were told I came from America—that was a novelty to them—so the boys chased me after school. Later I got medals in track! We lived on a farm. Part of our school curriculum was picking potato bugs off plants and putting them in jars. And in art class the teacher would take us out in a valley to look up at our town and draw our church and surroundings. I loved painting and still do. My mother and I came back to Barranquilla in 1948. My father was detained in France or Switzerland, when he tried to come with us. So we had to send for him later. I was 13 yrs. old then and didn’t understand what my mother had to do to get him back. I know there was some money involved in this transaction, but I don’t know how much. My friends Inge and Christa Evers returned to Barranquilla in 1950. After my return from Germany to Colombia, I went to the U.S.A. to school and after graduating from Hardin-Simmons University in Abilene, Texas, returned to Barranquilla. I met my husband-to-be, Ashley Newton Gordon, on the way back to Colombia. He was the second officer on the ship I was on, the George Lykes. We were married and have lived here Houston, Texas since then. The experiences we had (going through some hard times) were all good to experience, I think. I have friends and family in three countries and speak and write three languages. I learned something else, too, something very important. Es muy importante que el mundo sepa de las equivocationes que se cometieron en 1941 – 1945 o más, para que nó se cometan los mismos errores nuevamente. It is very important that the world know of the errors committed in 1941 – 1945 and beyond, in order that the same mistakes are not made again.